Now you can collect, stack and display a mash-up of all your favorite Disney characters in a totally new, whimsical scale! Each Tsum Tsum pack includes 3 different sized figures (small, medium, and large). 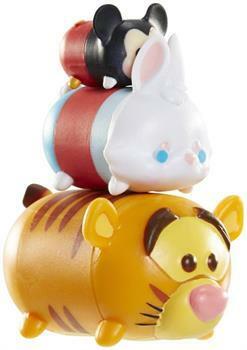 This set includes Mickey Mouse, White Rabbit, and Tigger. They're too cute, collect them all! Now you can collect, stack and display a mash-up of all your favorite Disney characters in a totally new, whimsical scale! Pack includes 3 different sized figures (small, medium, and large). They're too cute, collect them all! This set includes Mickey Mouse, White Rabbit, and Tigger.